People with disabilities shouldn't be defined by technology. 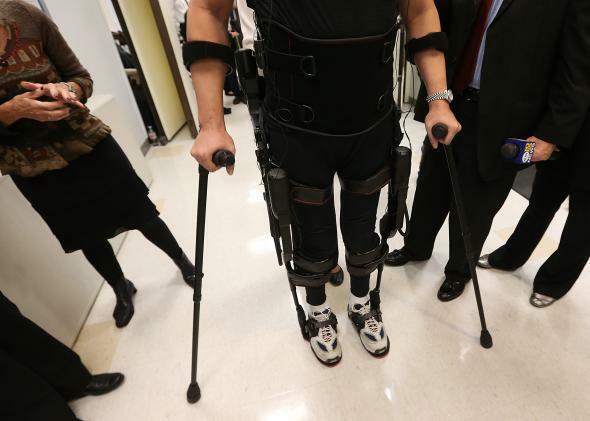 A paraplegic man demonstrates an exoskeleton. In the last decade or so, articles lamenting and/or questioning the role of technology in our modern lives have become nearly as ubiquitous as smartphones. Does technology free us or limit us? Is it changing humanity for better or worse? What are the social impacts on our children? We struggle with whether we control it, or whether the latest technologies (and by extension those who develop, market, and sell them) really control us. What most of these debates have in common is that they generally ignore people with disabilities. More rarely, an article may focus exclusively on people with disabilities with the underlying assumption that technology, everything from cutting-edge exoskeletons to pre-implantation genetic testing, must be an unmitigated good in the disability context since it mends something broken that needs to be fixed. Perhaps we need to rethink that assumption about the lesser lives of people with disabilities, as well as the questions we are asking ourselves. In a forthcoming article in the American Journal of Bioethics, Robert Sparrow, a professor at Monash University in Australia, makes the philosophical argument that even if genetic diversity could somehow be proven to be a collective and individual benefit to a genetically perfected humanity, such diversity should not include the lives of people with significant disabilities. That’s because greater social good will come directly at a cost to individuals with disabilities, “who have lower welfare than others and also lower welfare than other individuals who might have been born in their place.” If you are a person without disabilities (and I am one at the moment), that premise could seem logical, but it actually makes some breathtaking leaps. First is the foundational belief that the genetic material that we’re born with has an almost complete determinative effect on our individual and collective social welfare; the last time I looked, the genes for a propensity to human selfishness, competition, and corruption had not yet been identified, but presumably we’ll be better able to control ourselves once we have gotten rid of chronic conditions. Next is the assumption that a utopian world of genetic advancement, and presumably lower public and private health care costs, will occur without any corresponding diminishment of the discrimination and barriers to participation that actually produce “lower welfare” in the lives of people with disabilities. Sparrow is constructing a narrow argument in response to a well-known 2012 paper by feminist disability scholar Rosemarie Garland-Thompson titled “The Case for Conserving Disability,” which presents a counter-eugenic focus on the cultural and material contributions that disability provides the world rather than disability as an unequivocal liability. But it is nonetheless difficult to imagine the alternative use of a race scenario in this kind of intellectual exercise. There is widespread acknowledgment in the U.S. that social, economic, and political factors have a negative impact on the lives of young black men. But that premise generally leads to a discussion about how those external factors can and must be changed, not a philosophical argument that if racial characteristics could be genetically manipulated to maximize each individual’s highest expected welfare, then it would be morally repugnant not to do so. So what is it about disability that makes it fair game for at the very least philosophers’ slings, if not policy and political analysts? As nondisabled people, most of us assume that technology only enhances qualities we already have: speed, strength, quick thinking, fast communication, attractiveness (though tell that to anyone taken aback after meeting someone whose online dating profile featured an old picture). When it comes to people with disabilities, we habitually mistake a function—walking, breathing, seeing, speaking, etc.—for identity and, worse yet, worth. If technology can support a function, and we think function equals worth, then we can conclude that losing technology robs a person with a disability of their very personhood. I have a colleague who uses a motorized wheelchair and has cerebral palsy. She also lives a full life as an author, wife, mother, and activist. She has a speech impairment but does not use a communications device that would bypass her own voice, which can be understood with a minute or two of focus. Our world typically perceives her according to both the technology she needs for mobility as well as the technology she does not use; the way she naturally speaks has led to myriad assumptions about her lack of intelligence, the quality of her life, and whether there is a real person “in there” worth knowing. Nondisabled people seldom find ourselves so completely defined by our need for and choices of technology, even admitting the profound attachments many of us have to our devices. This unquestioning belief that all technology is good for people with disabilities bleeds over even into the discussion of pre-implantation genetic diagnosis, or PGD. There are many arguments for and against the use of PGD. Some focus on the level of individuals and families while others point to collective social consequences. But Sparrow’s article is the first time I have seen the argument that PGD is good for people with disabilities because at least they will not have to bear the burden of living lives of lower welfare than others; they will in fact not be born at all. Philosophical arguments that devalue the experience of living with a disability tend to be written without any discernable reference to the lived experience of an actual person with a disability. Now there is the further hubris of an argument that not only openly argues against the “social good” of disability, but purports to do so in the name of people with disabilities. Surely we could at least discuss technology and PGD with someone who has lived with their disability for a while and ask their opinion? If we have no one to ask, maybe we should examine the genetic diversity in our lives. This post is part of Future Tense, a collaboration among Arizona State University, New America, and Slate. On Wednesday, March 4, Future Tense hosted an event in Washington, D.C., on technology and the future of disability. For more information and to watch the conversations, visit the New America website.